The Yankees entered the World Series as overwhelming favorites, having set an American League record by winning 114 regular-season games. Then they eliminated the Texas Rangers and Cleveland Indians in postseason play to capture the AL pennant. Their opponents would be the San Diego Padres, who rebounded from a last-place finish in 1997 to win the National League pennant in 1998. Underdogs or not, the Padres looked like winners for most of Game 1. After six innings, the Padres boasted a 5-2 lead thanks to a pair of home runs from Greg Vaughn and one from Tony Gwynn. What's more, Kevin Brown, their ace pitcher, was on the mound. However, Brown was removed in the bottom of the seventh after permitting a single and a walk. And the very next hitter, Yankees second baseman Chuck Knoblauch, unloaded with a game-tying homer off Padres reliever Donne Wall. After Derek Jeter singled, lefty Mark Langston came in to face Paul O'Neill, who flied out. Two outs, a man on first, tie game, and the Padres were still very much alive. But after a wild pitch and two walks, Tino Martinez cracked a grand-slam home run over the right-field wall, and the Yankees suddenly led 9-5. The final score was 9-6, and the Padres never really got back into the Series. In Game 2, Padres starter Andy Ashby, battling flu symptoms, didn't escape the third inning, and the Yankees cruised to a 9-3 laugher behind seven strong innings from Orlando "El Duque" Hernandez. After two games in New York, the World Series moved to San Diego for Game 3. Playing at home, the Padres owned a 3-2 lead after seven innings. But in the top of the eighth, San Diego reliever Trevor Hoffman -- who had only blown one save all season -- permitted a three-run homer to Yankees third baseman Scott Brosius. The Padres battled back in the ninth, but came up just short, the Yankees winning 5-4. The Yankees completed their sweep with a 3-0 victory in Game 4, thanks to a number of infield singles and missed opportunities for the Padres, who stranded eight baserunners. 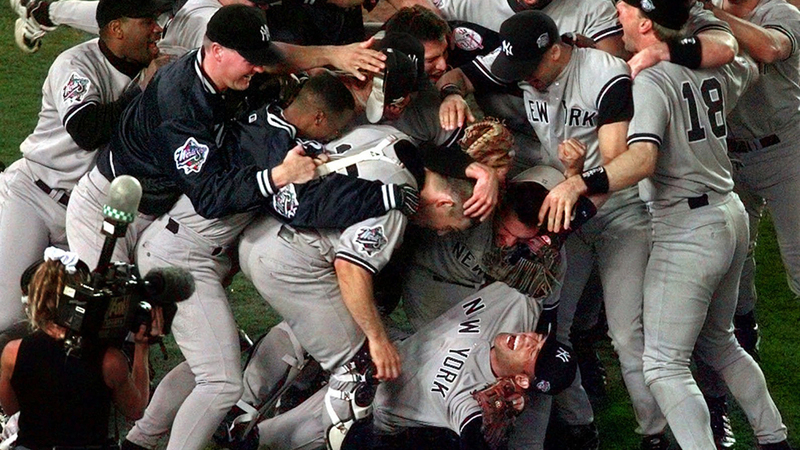 The Bronx Bombers were World Series champs for the 24th time.